The theme this week appears to be LOVE, it can be love for your friend, love for your spouse or love for your children. This image is from Dustin Pike's December membership club, I used the sketch from a new Ning group called Outlaws. They have a different kind of challenge each day and prizes at the end of the month, go and check it out here. The punch, of course is Martha Stewart and the ribbon is from my stash. Great card for Love! Such a cute image and a wonderful border too! Thanks for playing at Happileigh Scrappin' this week. We hope to see you back again soon...and good luck! What a darling card, just love your little penguin! Thanks so much for joining our Beary Sweet Challenge, I hope to see you again next time! Oh so super cute! Welcome to the Happileigh Scrappin' Challenge. Thanks for joining in the fun. Good luck. Such a cute card. Thanks for playing along at HappiLeigh Scrappin challenge. What a cute card! I hope you have a wonderful Valentine's Day! Thanks for playing along at the Beary Scrap and good luck! Gorgeous card. Such a cute image and love that punch! Oooh, I think that is another Martha Stewart punch I might NEED, its a bit yummy :) Great DP image, he has such humour. 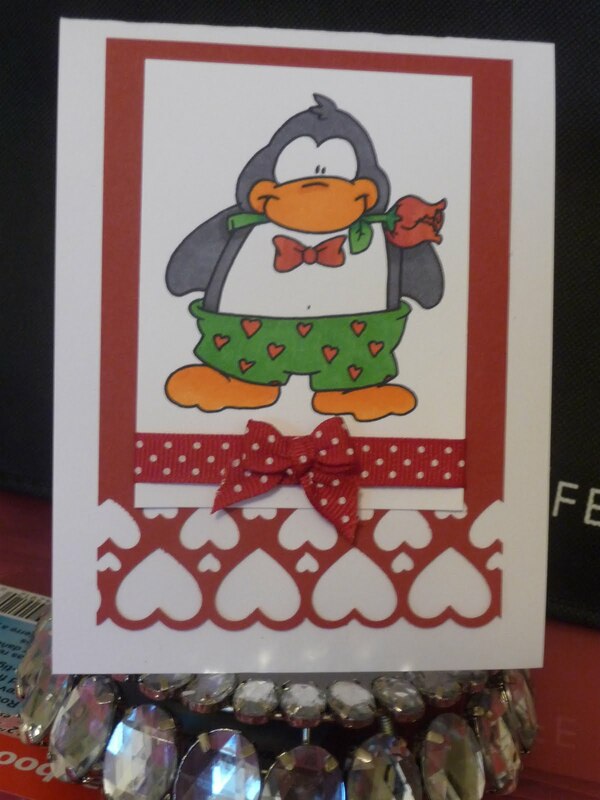 Very cute card, Thanks so much for sharing with us at The Beary Sweet Challenge. I hope to see you again. Good Luck! Oh I love the penguin! Thanks so much for joining our Beary Sweet Challenge to include "love" or "friendship". I love your card! Absolutely beautiful! I love the penguin. Thanks so much for playing with us at The Beary Sweet Challenge.